There is a helpful marketing solution with much lower cost and many great benefits. Magento 2 Affiliate extension supports to build an effective representative sales force and increase sales significantly. Affiliates are allowed to develop freely the own network with a number of tiers depending on campaign’s setting. Each campaign can configure different number of tiers with different commission rate based on product categories or customer group. The only thing Affiliate have to do is magento 2 refer friends via popular social channels such as facebook, twitter, google buzz,... with available marketing materials. They are banners and links. Banner is an advertising method in order to attract the audience to click on and be assigned to your product site. Image and text on the banners are customized flexibly by admin while Affiliate have rights to set the displaying positions. They can place on their websites, blogs or any social networks they want. 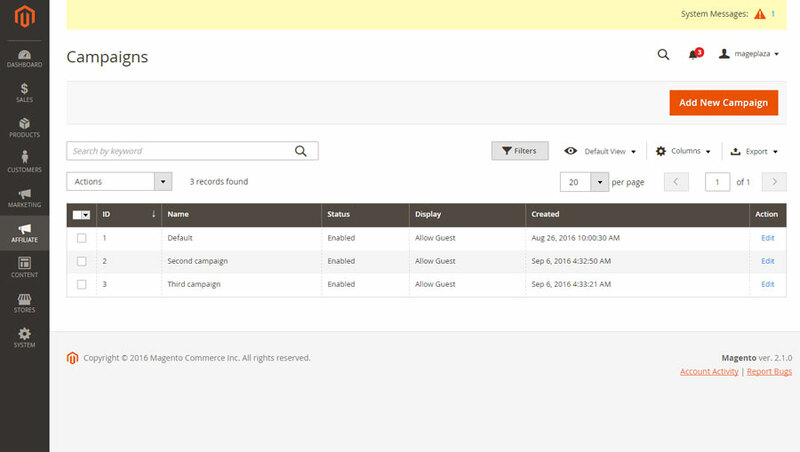 Then, each clicking and impression will be stored in the Statistic tab in the back-end. Affiliate extension provides two types of referral links: smart links and direct link. Smart links helps affiliate links shorter and friendlier within sending to friends. Moreover, Affiliates are allowed to edit link, for example www.domain.com/gift_for_you instead of complicated links. Especially for affiliates who owning the individual website, direct link is the awesome choice. Not sending the normal referral links with affiliate code, they only need to place the product direct link on their site and then the system will calculate automatically the number of click/ impression to pay commission basing on store owner set. For each order an magento 2 affiliate creates, you will pay for him/her by fixed percent rate, tier percent rate, fixed amount or tier amount. Until the affiliate network is larger, you are owning the powerful sales force. Receive commissions if there are the actual number of leads he generates. “Lead” may be signing up new accounts in your site or subscribing newsletter . This is based on number of click on affiliate banners and refer to your website. Fraud detection also included. The real statistic is shown in detail in personal account to follow. You can reward affiliates for lifetime event such as the total number of commissions, referrals, sales,.... With each milestone, the affiliate will receive commissions and be automatically changed to higher rank such as from Gold to Platinum, Platinum to Diamond. Commissions affiliates earn from Affiliate network are stored in their store credit in Affiliate account. The credit information includes available balance, holding balance (the minimum of account balance), total earned and total paid for shopping online. Therefore, controlling of spending commissions is easier and clearer than ever. Moreover, allow transferring into cash when Affiliates create request to withdraw. Affiliate Payment plugin gives you the ability to use many payment methods like PayPal, Bank transfer, offline payment, to pay commission for your affiliates. Thus, the commission from affiliate program is smart online and offline payment method. Affiliate system also enables to manage many datas: Affiliate accounts, transactions, sales, clicks and impression via statistic table and advanced report so that you can have an overall analysis and evaluation about the affiliate program’s performance then take a solution to improve it.